Undoubtedly Lebanon's premier sight, the Jeita Grotto is a must-see tourist attraction. 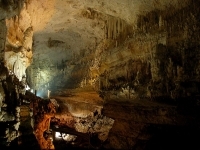 Located just 14 miles (about 22km) from Beirut, the Jeita Grotto is an underground complex consisting of two separate, but connected, limestone caves, spanning an overall length of 5.6 miles (about 9km). Situated in the Nahr al-Kalb river valley, the caves are accessible by boat and house a series of limestone concretions shaped for millennia into unique formations, sizes, and colours. Known as 'Mother Nature's Masterpiece', the Jeita Grotto also features an incredible upper gallery. The upper gallery is accessible via walkways carved into the natural rock where you can observe the world's largest stalactite. A finalist in the New 7 Wonders of Nature competition, no holiday in Beirut would be complete without checking out these extraordinary caves.